Back to track. Doing two lots of conditioning voluntarily, yep you read that right, and Mr B makes his XC debut. Post race recovery and easing back into easy running. Adjusting 'normal' as I go. Also... trying not to be too nosey about Mr B's running plans. Though they will soon feature here! So there it was. My last marathon for a year, at least. Gulp. Gulp, for a variety of reasons. Gulp, for the uncertainty I mentioned in my preview post that meant I felt like a newbie marathoner again. Gulp, for the concern that however much I know it's fine to run a marathon when pregnant and I'd had a backup go-ahead from the ultrasound-scan-doctor only 5 days before, still what if something happened? Finally, gulp, because this is my happy place and for all the talk of not relying on running to find my joy (and I don't, there's more to life) this still remains a comfort zone of endorphin filled smiles for me and a place where I've found that I might occasionally be something a smidgen more than average and now I will have to put my money where my mouth is and enjoy what running my body and new permanent job will allow and take it as it comes. But underlying all of that, the bubbling excitement that I get to run a marathon and heck well, let's do this. 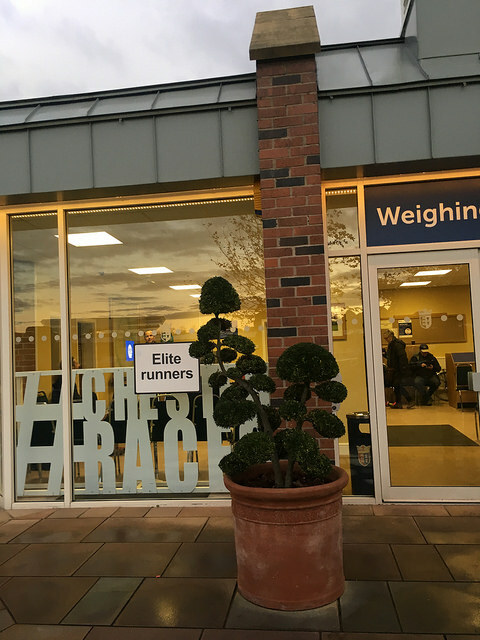 We stayed with friends in the Wirral the night before and thanks to my Florence time I had Elite entry which meant guaranteed free parking onsite (others could park but had to pay £3) , indoor changing area, loos and even food afterwards. Jackpot! However, we had just polished off our pasta (not too much) dinner when I received an email from the organiser saying that due to the rain the previous day, they were not offering parking onsite anymore. On checking with my race-liasion lady (who was answering emails at 10pm - legend!) she confirmed that we might not be able to park unless we got there at 6.15am. Argh! We looked at train and other options but decided to just hope for the best and arrive at 7.30 as planned and see what happened. I don't think I would have been that chilled if I was gunning for a PB. Race morning and Mr B seemed pretty chilled. We drove to the racecourse and straight into a free parking spot, the organisers were doing a fantastic job. I didn't hear of a single person having trouble finding a space somewhere. At 8.45 after even more loo-stops than usual (hello pregnancy bladder) we were walked to the start line. Mr B and I ducked out of the Elite pen and back a few rows to get near his 3:15 pacer (I stood nearish, but not near enough to be running with him. As it happened, we all shuffled up and I ended up starting a bit ahead of him in the pens, despite being sure that 3:30 was an optimistic target. 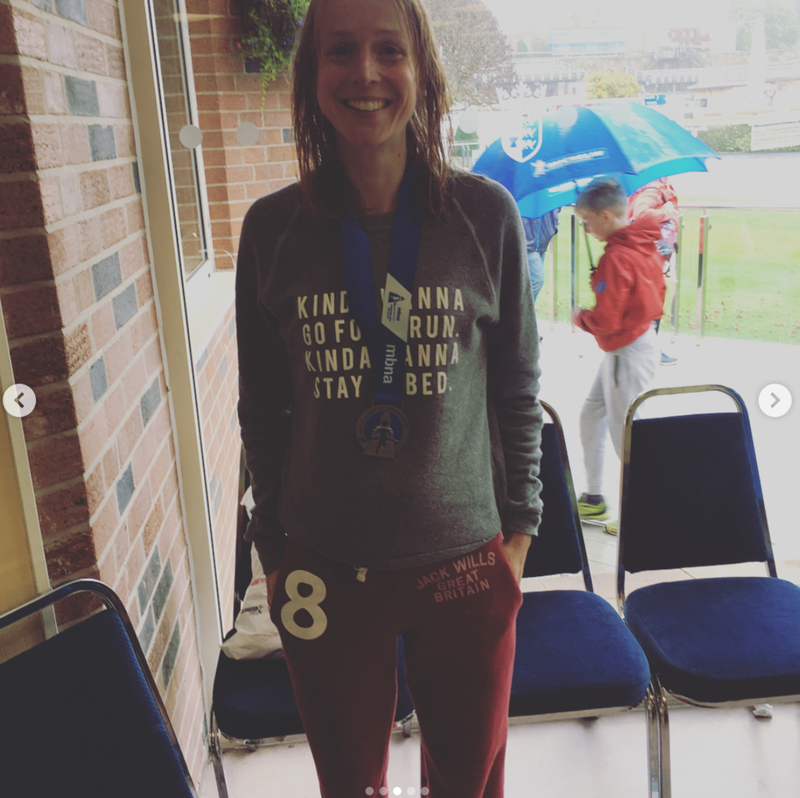 I had thought a few times before that it would be nice to justify my place in the elite entry by getting 3:15 (though it's sub 3 for a free place) but my main thought was that a London Good For Age and BQ while pregnant was quite a nice aim. Ben FP and I had chatted before and agreed that because I take longer to get into stride now, I'd go out at about 8'00/mi but not look at the watch and then ease it up if I felt good and not go under 7'00/mi (ha!). I was nervous before starting as I'd not run more than 13miles for many weeks and a lot changes each week when you're putting on kgs here and there! 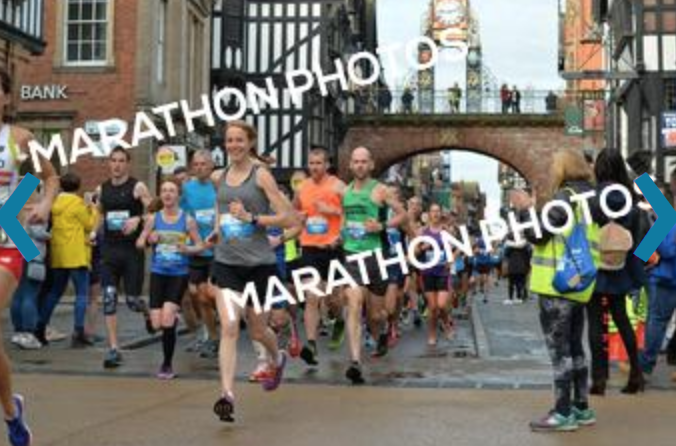 Up out of the race course and into the streets of Chester, the marathon calm descended on me almost straight away. As always, I found the patter of feet and breathing of those around me almost meditative. I was surprised at how quickly we hit an uphill but kept pottering on and enjoying the modest crowds through the town centre. First mile at 7'32 - a bit fast but fine, I can settle down now. Down past the Cathedral and off to cross the river and head out of town. I stopped looking at my watch, and now looking back I see I did a 6'58 there, but it was down hill so it doesn't really count. The next few miles I can't really remember other than hearing the 3:15s chatting behind me at one point and thinking that I might as well stay ahead if I felt fine as I had no idea what the later miles would feel like. I was surprised by how quickly the time I'd normally take my first gel (High Five, Orange) crept up (about 45mins in - just over 6 miles). In past races I've been completely ready for it, waiting for it in fact, but this time I waited a bit longer because I didn't feel the need yet (though obviously you have to pre-empt the need for the fuel). I ended up running with a bit of a group and we exchanged a few comments and a bit of a discussion about two of them going to Comrades next year. At some point just after this I ended up chatting to a guy called Dean Allaway. He was running his 98th marathon and we had a lovely time talking about all the different races he'd done and various marathon experiences. He had a cold so was looking for the 3:15-3:30 mark, tops and we realised we were a bit towards the top end of that but it just felt good chatting and running. It's funny - before we started talking I wouldn't have said I could keep the pace AND have a conversation, but clearly I could! At around mile 10 you cross into Wales, though I clearly wasn't paying attention! The weather was still grey and pleasant and there were little pockets of supporters along the way. The water stations were well stocked (with tiny bottles, not cups - yey!) but I saw a few people (actually, I think all wearing England vests) walking back the other way. I normally take my next gel at 1:20 so being a creature of habit, that's what I did, though not the whole thing. I took a couple of sips of water at every aid station as I was conscious that the main advice for pregnant ladies is that you need to stay well hydrated.... which is ironic giving the need for the loo all the time! Miles 13-15 are the the only section where it loops and you get to see runners coming the other way. I love this on marathon courses as you get a real boost shouting for each other, especially on the quieter races. I was feeling the effort in my knees now - something I've not had before, but I guess it's the change in gait and extra weight. I wondered how long I'd keep up the pace for as I was still averaging under my 7'27/mi, which I knew was Mr B's target pace for 3:15. After that, the next few miles were more effort but still comfortable and we were joined by the Metric Marathon runners coming the other way. Again, I found this a real help as it gave me new people to pull me along. It's funny though how different people's minds work different ways, as Mr B found it really dispiriting seeing fresh looking people at this point. I was wondering when we'd get back into Chester and also thinking about the famed hill at mile 24, but still cheering other runners and enjoying the countryside. It's never *easy* doing the last 6 miles of a marathon, so I'd be lying if I said I wasn't thinking about a nice sit down at points, but in general it felt comfy. I had a few chats with the bump/hitch-hiker along the way and told him that he just needed to give me a good kick if he wasn't happy and I'd stop right then! It had started drizzling by now and I was quite glad of the coolness. I had a caffeine gel which I could take for extra oomph at the end if I wanted but I decided not to bother as I felt like I'd had plenty of sugar by then. It's not until miles 23/24 that you start to get back into the city and by now people were starting to egg each other on to hit times. I eased off the pace a bit in the hope I'd see the 3:15 crew and saw a few people I'd chatted to further back. At this point I was taken under the wing of a very sweet guy who told me to 'leave it all out there'. I didn't have the heart to tell him I wasn't planning to do that today! He told me that the 3:15's were way back (implying they were far off pace) and so I figured I might as well just try and sneak in under it. Mile 24 was actualy quite a bit of incline, but they have "race angels' who run from the bottom of the hill to the top with you and then send you on your way. A really nice idea. Round the corner, down along the river and despite the drizzle there was a good turn out lining the route back to the racecourse. I knew I had 3:15 in my sights and couldn't quite believe it, so it was great to relax into the finish. You enter the race course on the bend and run the final section on grass. This was largely ok, though a bit squidgy and I hear it got really boggy later, which is pretty tough at the end of a marathon! As I came down the home straight I even managed to put in a tiny spurt of speed and over take a couple of people. I crossed the line in 3:13:08 - a time that a year ago would have been disappointing, but which I'm stoked about. More to the point I had an absolute blast. I could have carried on running at the end too. I stopped as soon as I got over the line to wait for the 3:15 gang to come in. They just about timed it perfectly, as did the 3:30's but no Mr B. It was hard to know whether to wait or go and get my phone so in the end I dashed back to the elite area to grab my bag. On the way I bumped into our mate Aaron who was also running but was in need of a sit down and some sugar, so he came with me (thanks to the organisers for letting him in). Shortly after, Mr B rocked up looking his cheeky self and fine. He'd been bang on pace for the first 13 miles, then had to ease it off a bit and then mile 17-20 just wasn't happening for him. At this point the rain had started and he got too cold so he got the refuge bus back to base. 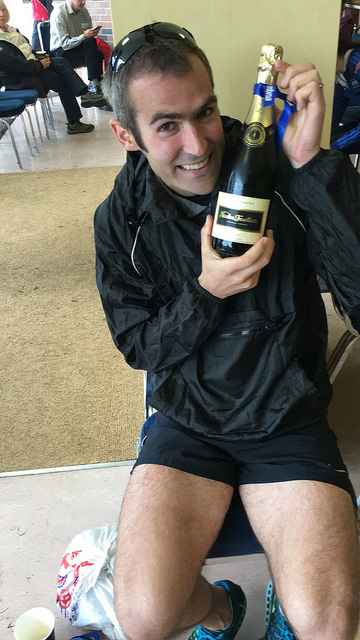 A shower, some sandwiches and some friendly chats with the winner of the ladies Metric race (who donated her champagne to Aaron) we set off home. I'm sad Mr B didn't get the race he deserved but I think it was just one of those days. Oh, and the hitch-hiker has been plenty active since, so he's obviously not too annoyed with me for dragging him on a 26.2 mile trip and a VLM Championship qualifying time. Now, it's time to put my money where my mouth is and just enjoy running as and when I can and enjoy supporting Mr B on his journey to VLM 2018. Final week before Chester Marathon. An epic track session and a park run.